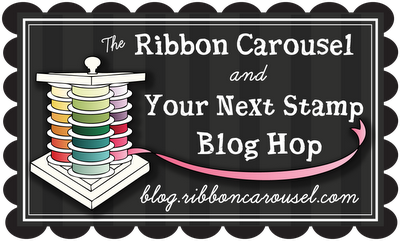 The Ribbon Carousel and Your Next Stamp Blog Hop! Hello! I'm so excited that I get to hop along today with The Ribbon Carousel and Your Next Stamp! Members of both DT's have some fabulous projects to share, and we hope you'll join us! One lucky commenter will win a Ribbon Carousel and another will win a $10 YNS gift certificate to spend on stamps of their choice! For my card I used this super adorable image called Ellie with Pressies, along with some fabulous red and blue ribbon from the June Ribbon Club Kit. The dp is Simple Stories Summer Fresh. Karen, owner of Your Next Stamp is generously offering a coupon code to all blog hop participants for 15% off any online order placed from today through June 30th, so make sure you take advantage of that deal! Your card is very cute! Love it! Gorgeous card! Love the layout, papers and how you have the presents extending out past the circle mat. Great! I love all of your elements...the color combos/patterns, and how you popped the presents! Very nice! Who wouldn't love to get this adorable Birthday Card --- love the way you colored little Ellie with Pressies! Great card--I like your coloring and papers. Love the color and pattern combos! She is so cute!! Love the papers you used! Kerri I am so in love with this card. The mix of paper is fabulous!! Very cute card. Love it. What a cute birthday card!! What a "happy" birthday card. Such lovely bright colors. Brings a smile. Fabulous Kerri! Love this fun design! 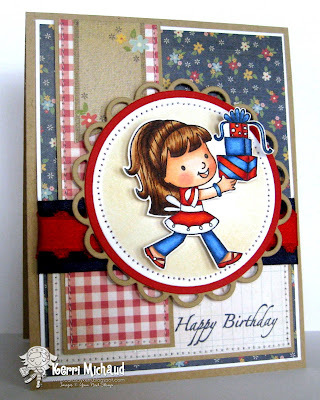 Love this darling image with that cute pile of gifts - adorable layout choice also! Ellie is beautiful! You have colored her perfectly and I enjoy the patriotic summer theme. Pretty red ribbon finishes off your card so pretty. So sweet and I love the red and blue! So cute with the patriotic colors.